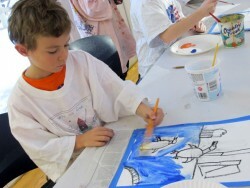 Glen Arbor Arts Center’s youth art program focuses on the creative potential of all and are designed to provide the basics of art learning and to encourage the development of young artists. Our teachers are artists themselves and love to bring out the natural creativity of young people. Tuition assistance is available, see “more details” below. What to bring / location / etc.